too much when you are waiting for someone ..
for her two minutes defined her entire life, for him two minutes ended his life.. It was her birthday she was in a rush to go to her own party.. He was going back home to his wife and new born kid ..
but not one of them thought it to be worthwhile to ignore that or to stop for two minutes and then talk on their phones..
they answered their phones, she while driving her car and he while riding his bike ..
somehow she hit him going at a speed of 100 km/h .. and he flew from his bike and hit his head on the curb and broke his neck .. instantly killing him ..
She didn't notice that she was at a crossroads ..
Next second she was hit from the side by a truck ..
her car tumbled like a toy and rested on its roof ..
people rushed to both of their help but he was beyond help .. and she crushed her spine .. instantly paralyzing her from waist down making it impossible for her to walk again .. It took her 6 months to recover and leave her bed .. and she then decided to educate people about the dangers of talking on the phone while driving ..
She holds seminars all around the world but she still stops and think about what her life could have been if she would have just taken those two minutes to properly stop and then answer that call which changed her life for the worse. P.S. - Please friend never ever answer your phone while driving or riding your bike it really is very dangerous. Very informative post.. talkin on phone can be very dangerous even if we have bluetooth in our car..all the best. Thanks Rani for liking the post. All The Best to you too. That was a good one Vikas. Its not at all unusual to see people talking on their phones while driving . When are we going to learn ? After this 2 mins in life ? good luck for the BAT ! Mmm! U used the topic very well to press an important issue. Good one, using the phone while driving is dangerous indeed... I hit a car once, too when I got distracted by the phone ringing ... goot luck for BAT! Thank you very much Ash and yes Phone is indeed a bane while driving not a boon. Good Luck to you too for BAT! Mobile Mania .. everyone thinks that 'it will not happen to me'! But who knows? Always better to take care. Good and very relevant message. What a beautiful message Vikas. I loved your narration so much!!!! 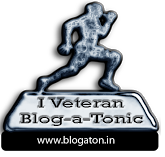 And congrats, YOU ARE A BLOG-A-TON VETERAN; I know I'm late to wish you but I think I'm first.. Keep Writing..!!!! I've suffered a very similar accident, and I'm glad you came up with a nice way to post on such an important topic. Best of luck. Sorry to hear about the accident Sandy and thanks for liking the post. Thank you once again. Nicely written and communicated the message :) ATB! Thanks Shashi for wonderful comment. Sadly that si the truth, its the same with helmet too. ATB for BAT. Thanks Anjali for the wonderful comment Good luck to you too for BAT. Well narrated. Simple things matter. We often term simple preventive measures to be silly and pay penalty. Thank you very much for liking the story and taking out your time to comment. So True and sad that people don't understand the reason behind rules and just keep on breaking them. Thanks Menachery for reading and commenting. Thanks for all your support ATB. Thanks very much for liking and commenting. This issue is very close to my heart as I have seen people getting hurt due to not wearing helmets or talking on phone. I personally almost always follow the rules. Thanks again .. ATB. Thats quite a relevant message and really well put. At the same time it is quite disturbing also. Thanks very much Ash for stopping by commenting. Glad you liked the post. ATB to you too. Thanks for the appreciation ATB to you too. well written vikas... story with a message .. Nice, All the best for BAT!! Thanks very much Sweta for appreciating the post. ATB. Thank you very much for the wonderful comment and appreciating my work. Thanks and All the Best for BAT to you too. Fantastic post! It is a given fact the a majority of us still flaunt the rules and use our mobile devices. Good reminder. Thanks Richi for liking and commenting on the story. Sadly it is so true.